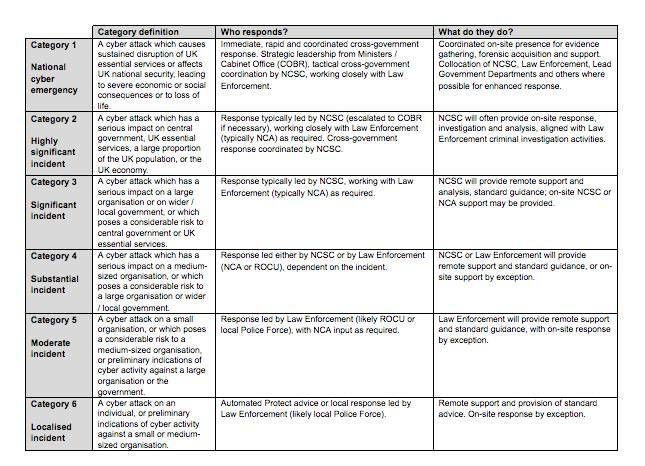 Categorisation into bands ranging from six down towards one (the most severe) will span the full range of incidents from localised attacks against individuals or SMEs up to "national cyber emergency". The NCSC said it has responded to more than 800 significant incidents since October 2016, and their incident responders will now classify attacks into six specific categories rather than the previous three. The changes, which are effective immediately, are aimed at improving consistency around the incident response as well gearing the UK up towards making a better use of resources - ultimately leading to more victims receiving support. The incident category definitions delineate what factors would happen to activate a specific classification, which organisation responds and what actions they would take. Paul Chichester, the NCSC’s director of operations, told us: “This new joint approach, developed in partnership with UK law enforcement, will strengthen the UK’s ability to respond to the significant, growing and diverse cyber threats we face. “The new system will offer an improved framework for dealing with incidents, especially as GDPR and the NIS Directive come into force shortly." The framework encompasses cyber incidents in all sectors of the economy, including central and local government, industry, charities, universities, schools, small businesses and individuals. Ollie Gower, deputy director at the National Crime Agency, added: “This new framework will ensure we are using the same language to describe and prioritise cyber threats, helping us deliver an even more joined up response. Any cyber attack which may have a national impact should be reported to the NCSC immediately. This includes cyber attacks which are likely to harm UK national security, the economy, public confidence, or public health and safety. Depending on the incident, the NCSC may be able to provide direct technical support. People or businesses suffering from a cyber attack below the national impact threshold should contact Action Fraud, the UK’s national fraud and cyber crime reporting centre, which will respond in accordance with the new incident categorisation. Information processed by the new framework will ultimately be used to generate a more comprehensive national picture of the cyber threat landscape. Disappointingly, the newly introduced classification system doesn’t go up to 11. Nor does it have a hors category, like the most difficult mountain climbs of the Tour De France. Hors signifies climbs that are "beyond categorisation". There’s no colour coding in the new system - so there’s no brown alert either.